Memory Scaling on Haswell: DDR3-1333 to DDR3-3000 Tested with G.Skill Enabling XMP with ASUS, GIGABYTE, ASRock and MSI on Z87 Memory Scaling on Haswell: CPU Real World Memory Scaling on Haswell: CPU Compute Memory Scaling on Haswell: IGP Compute Memory Scaling on Haswell: IGP Gaming Memory Scaling on Haswell: Single dGPU Gaming Memory Scaling on Haswell: Tri-GPU CrossFireX Gaming Pricing and the Effect of the Hynix Fire Conclusions: Do you need a 3000 MHz C12 memory kit? The activity cited most often for improved memory speeds is IGP gaming, and as shown in both of our tests of Crystalwell (4950HQ in CRB, 4750HQ in Clevo W740SU), Intel’s version of Haswell with the 128MB of L4 cache, having big and fast memory seems to help in almost all scenarios, especially when there is access to more and more compute units. 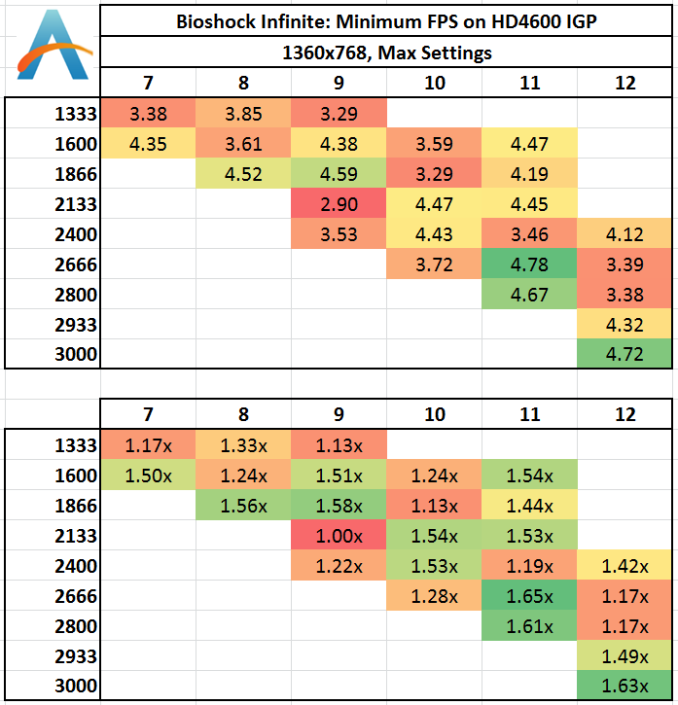 In order to pinpoint where exactly the memory helps, we are reporting both average and minimum frame rates from the benchmarks, using the latest Intel drivers available. All benchmarks are also run at 1360x768 due to monitor limitations (and makes more relevant frame rate numbers). Average frame rate numbers for Bioshock Infinite puts a distinct well on anything 1333 MHz. Move up to 1600 gives a healthy 4-6% boost, and then again to 1866 for a few more percent. After that point the benefits tend to flatten out, but a bump up again after 2800 MHz might not be cost effective, especially using IGP. 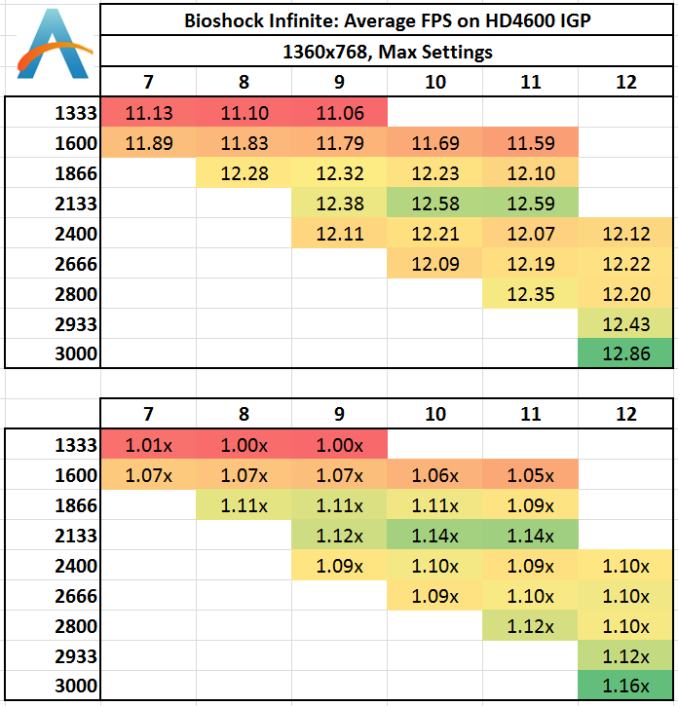 Unfortunately, minimum frame rates for Bioshock Infinite are a little over the place – we see this in both of our dGPU tests, suggesting more an issue with the title itself than the hardware. Similar to Bioshock Infinite, there is a distinct well at 1333 MHz memory. Moving to 1866 MHz makes the problem go away, but as the MHz rises we get another noticeable bump over 2800 MHz. 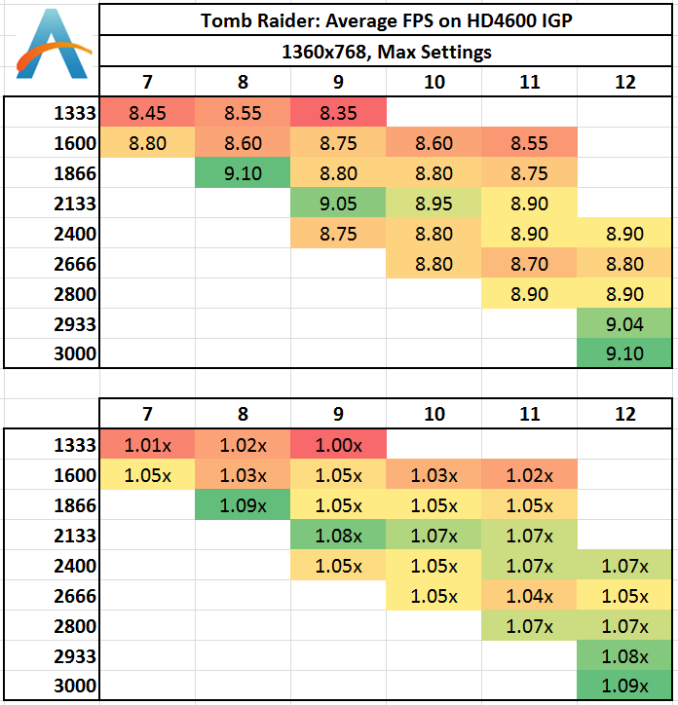 The minimum FPS rates shows that hole at 1333 MHz still, but everything over 1866 MHz gets away from it. 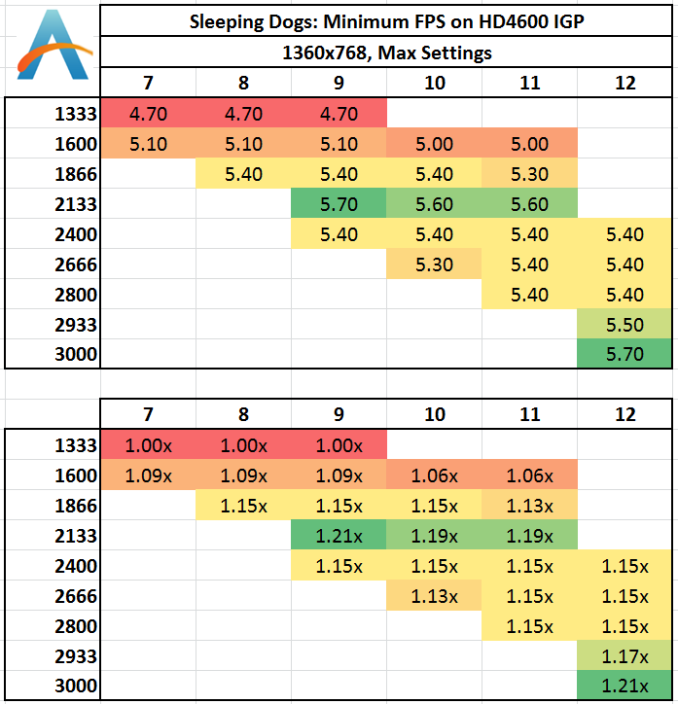 Sleeping Dogs seems to love memory – 1333 MHz is a dud but 2133 MHz is the real sweet spot (but 1866 MHz still does well). CL seems to make no difference, and after 2133 MHz the numbers take a small dive, but back up by 2933 again. Like the average frame rates, it seems that 1333 MHz is a bust, 1866 MHz+ does the business, and 2133 MHz is the sweet spot. Memory Scaling on Haswell: IGP Compute Memory Scaling on Haswell: Single dGPU Gaming Memory Scaling on Haswell: DDR3-1333 to DDR3-3000 Tested with G.Skill Enabling XMP with ASUS, GIGABYTE, ASRock and MSI on Z87 Memory Scaling on Haswell: CPU Real World Memory Scaling on Haswell: CPU Compute Memory Scaling on Haswell: IGP Compute Memory Scaling on Haswell: IGP Gaming Memory Scaling on Haswell: Single dGPU Gaming Memory Scaling on Haswell: Tri-GPU CrossFireX Gaming Pricing and the Effect of the Hynix Fire Conclusions: Do you need a 3000 MHz C12 memory kit? That's because just like when HDD prices skyrocketed due to the 2011 Thailand Flood, RAM prices have skyrocketed due to the 2013 Hynix Factory Fire. Prices had started to rise around early 2013 due to market consolidation and some other electronics (tablet, console, etc market needs), nothing huge, and they were actually starting to drop until the factory fire. 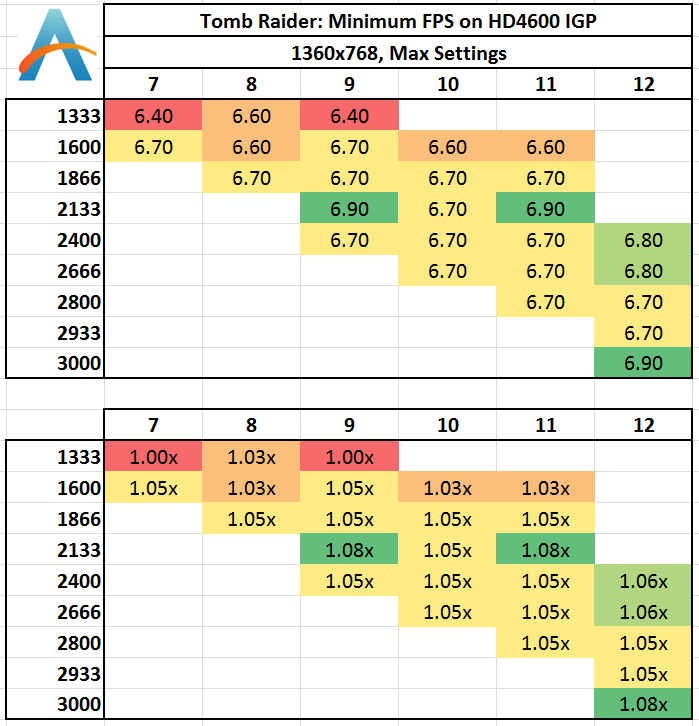 As for 1600 C9 being some sort of standard, well, what Intel/AMD specifies as their rated RAM speed is no more useful than what they specify their CPU speed, as we know the chip can go way above that. JPeople who are savvy and know how to buy RAM, can buy RAM easily capable of 2400mhz CL8 by researching the RAM IC. PSC/BBSE is easily capable of 2400mhz CL8 and generally costs ~$60 per 8gb (ie similar to the cheapest ddr3 ram). You can find some Hynix CFRs (double sided, unlike MFR, meaning they don't hit the high mhz numbers, but way better 24/7 performance clock for clock, kinda like dual channel vs single channel) for around $65, like the Gskill Ripjaws X 2400CL11 (currently like $75 on newegg), which will easily do ~2800mhzCL13. Relational results are helpful -I think they've been added since your comment- but I also like to see the empirical data as is also being listed.